A Dentist in Bullard Cares for Smiles of All Ages! As we get older, there are certain health concerns that require more attention than we had ever given before. Senior oral health care is one of them. In your lifetime, you’ll only get one set of permanent adult teeth, so it’s crucial to take care of them throughout our lives. Issues such as gum disease or other general health concerns may contribute to tooth loss. Although aging is unavoidable, if you’re suffering from tooth loss before the age of 70, you may be aging much faster than you think. Your dentist in Bullard wants you to know the importance of maintaining healthy teeth and gums as you get older. Heed this important dental advice and you’ll have your teeth for much longer! Not only could you possibly face tooth loss as you age, but your general health can decline very quickly with the loss of teeth and poor dental hygiene. Without proper care for your smile, older patients raise their risk for dangerous diseases. This disease is one form of dementia. It’s caused by a loss of brain function from dental bacteria that travels from the mouth, into the bloodstream, and blocks places of the breain. Many patients may forget how to take care of their teeth properly or why it’s so important to keep their mouth clean, leading to additional dental problems. Not to mention Alzheimer’s disease can actually be catalyzed by gum disease and dental bacteria traveling to the brain. This common medical issue causes bone to lose density, increasing chances for breaking them. This doesn’t just mean the bones of our arms, legs, or feet. This goes for jawbone density as well. Without sufficient jawbone density, your teeth can easily fall out. Some medications may cause dehydration more than others. Without saliva (your body’s natural mouthwash) there may be food and other debris that settle within your teeth. This can cause decay or other dental problems. Care for your dental prosthetics. It’s still important to take care of your teeth replacements as if they were your natural teeth by brushing and flossing regularly. If you have dentures, you must clean them daily. Ask your dentist in Bullard about the best hygiene practices. Keeping your body well-nourished is a big part of maintaining good oral health. Eating natural fruits and crunchy vegetables keep your jawbone strong and healthy while giving your body the nutrients it needs. Even if you need to soften them by cooking them, it’s important to get them into your body. A durable, bright smile looks great at any age. 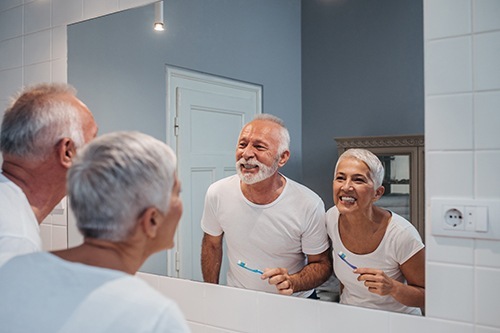 Understanding the issues seniors may face when caring for their teeth is a big part of preventing oral problems and our dental team works hard to ward them off. Dr. Morgan is here to provide excellent dental care for patients of all ages!